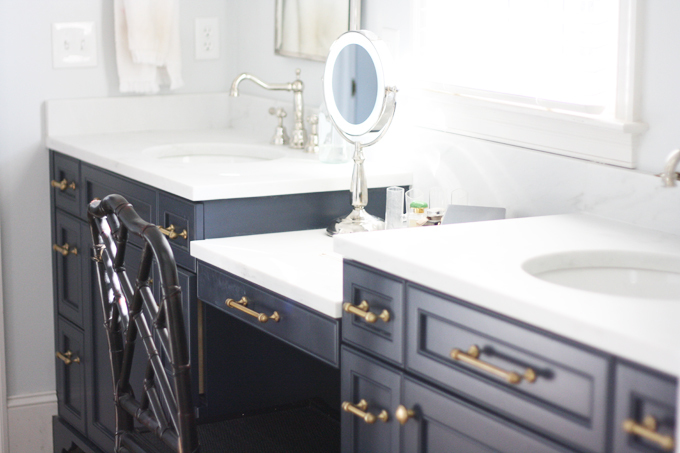 Today, it's all about our master bathroom. Who's excited?! 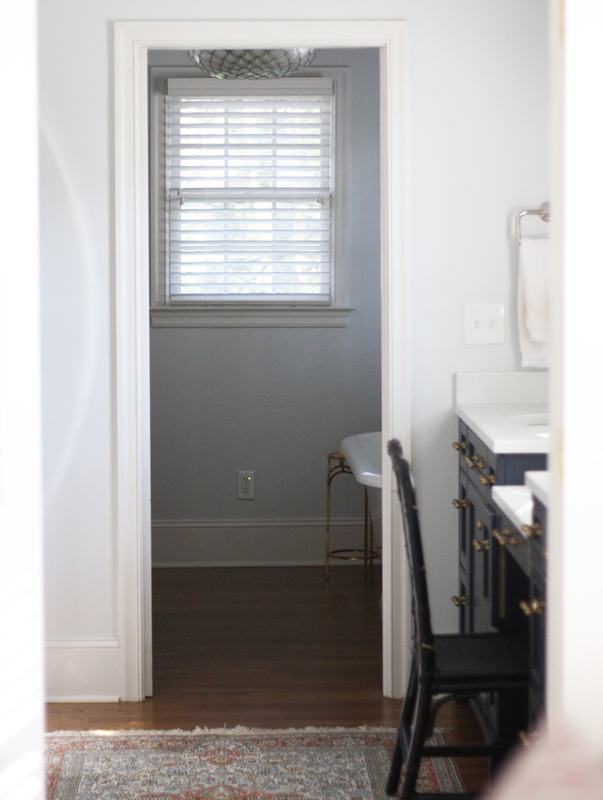 True story: the very first thing I chose when we started our renovation was our master bathroom marble. It was quite the ordeal to get it completed, and I would never recommend the company we purchased it from, but it was worth the headache. It's called Alabama White and is from a quarry Sylacauga, Alabama. It is almost entirely white with little to no grey veining, and I love it. 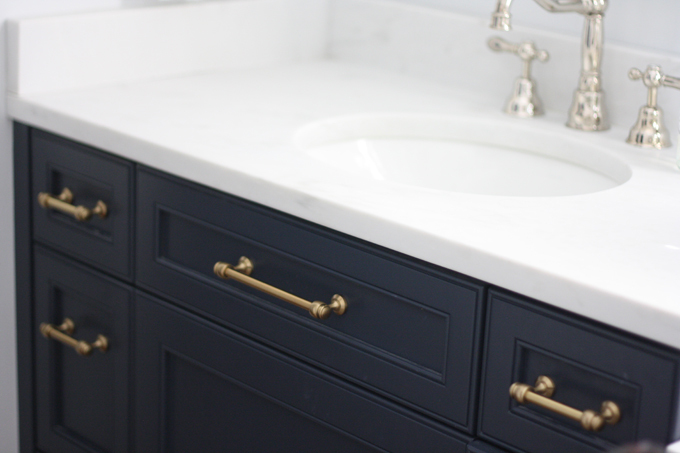 There are a few other things I love about our master bath starting with the navy cabinets. 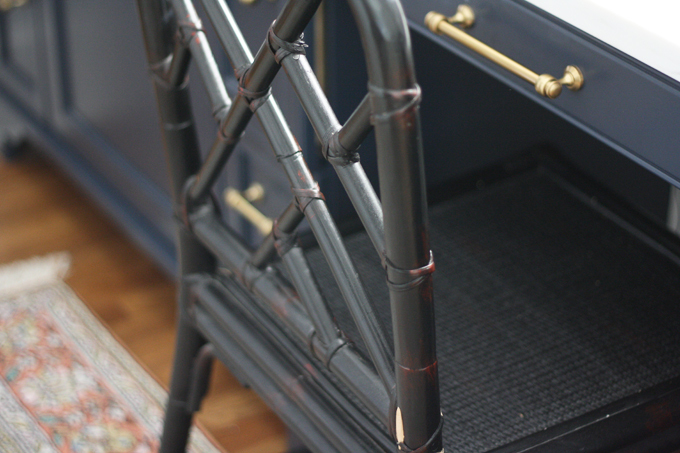 The color is Hale Navy by Benjamin Moore, and we paired them with brass pulls from Restoration Hardware. I am a big fan of mixing metals (and mixing patterns and furniture in general), so we chose polished nickel for the rest of our finishes throughout the room. 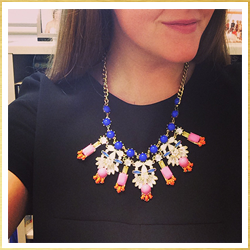 I think it's so important to try to mix and match different patterns, colors, and metals. I realize this is not for everyone, and some people love a simple, monochromatic feel, but I think mixing these metals together really adds so much warmth and character to our space. 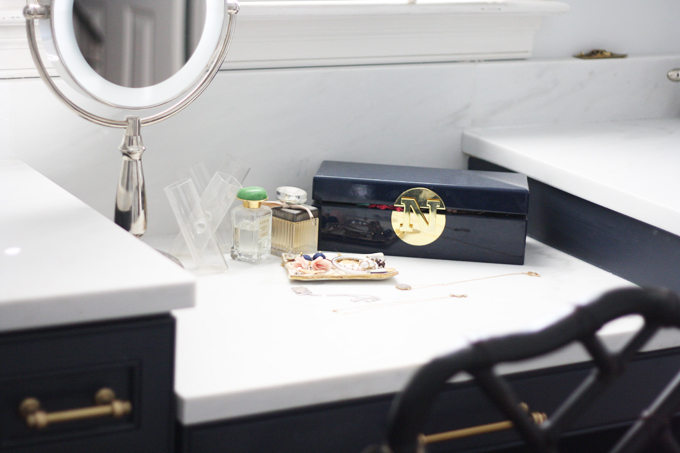 Our his/hers closets are directly across from our vanity. While the closets are pretty small, it's so nice for each of us to have our own space. I will say, the closets are far from finished, so no looksies at those today! I just added this awesome vintage handmade rug from India recently, and I think the colors in it play so well with the rest of the room, including my nudes by Kristin Blakeney. I had them framed with navy mats via Framebridge to match the cabinets. Love. (P.S. More on my experience with Framebridge later). 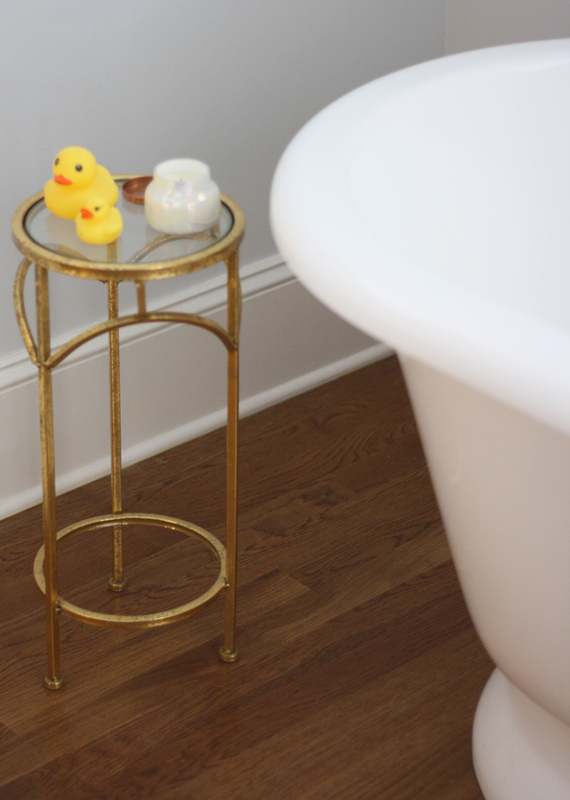 The freestanding tub was one of my must-have wish list items, and the light fixture from Serena and Lily really makes a statement in the tub / separate water closet area. This light fixture pretty much inspired all of the finishes in this room. I got it for Christmas at the beginning of our renovation, and it lived in a box in the tiny house we rented for 4 months until we finished. It's on a dimmer and is perfect for peaceful baths. 1. 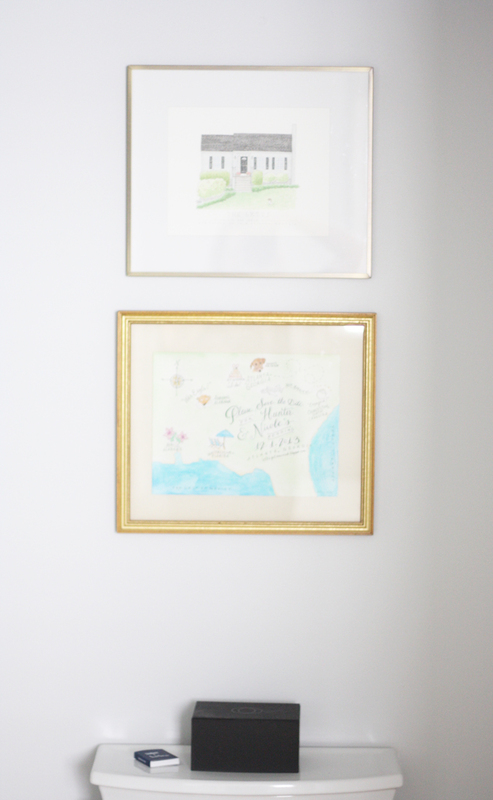 This room backs up to our guest room, so the space was originally drawn as a guest closet. We don't have kids and even if we did, no one needs a closet that big for anything. We've got plenty of storage, so we absorbed the space into our bathroom for our shower. 2. Nothing makes me happier in this room than the fact that visitors can't see any of our unsightly towels, washcloths, or robes. Everything is tucked near the shower for easy access and stays tidy and out of sight! That's it! Of course I could use window treatments, fresh flowers, etc. but this is what I see every day. Let me know if you have any questions about anything you see!